Snow-clad mountains, beautiful glaciers, spectacular waterfalls, narrow fjords, Edvard Grieg, world heritage sites, steep railways, long tunnels, Trolltunga, old power plants, low hanging clouds, small ferries, sheep and cows on the road, questionable road standards, rows of cherry and apple trees – this is a short trip report from Hardanger in Western Norway with a focus on Trolltunga, Folgefonna glacier, the Flåmsbana (Flåm railway) and the world heritage site of Nærøyfjorden! Please get in touch if you have any questions or comments. All pictures are taken by Nikki and Gard with our cameras (Canon EOS 450D and Panasonic Lumix camera) - you can see a lot more photos on this page. Note that there is a copyright mark on the photos and you can get in touch if you want to use them. You can also find some of the photos from our trip on my instagram account. From time to time I get questions why Nikki and I travel so much abroad when we live in such a beautiful country. As you might have noticed from my trip reports on gardkarlsen.com we normally travel to “exotic” destinations like Malaysia, Italy, Maldives, South Africa (for obvious reasons) etc and we normally go to places like that as we want to experience a different culture, different food, see spectacular places...and it is not a secret that we also travel to places to get a bit better weather as the weather here in Norway can be cold and unpredictable. We live in the south west of Norway in the town of Stavanger and this is really the start of fjord Norway in many ways. From here you can easily reach spectacular places like Preikestolen and Kjerag but there is much more to see! This is a trip report that covers a bit of Hardanger and Sogn and it is based on two trips to the area in 2012 and 2013. Tip: If you want to check weather stats for Norway you should check out weatherbase. For a weather forecast for the next few days you should check Yr.
After seeing breathtaking places like Kjerag and Preikestolen it is hard to find places that can top this. But a few years back I saw a photo of a place called Trolltunga (meaning the tongue of the troll) and it looked beautiful. At the same time I was looking at climbing via ferrata in Italy so when I came across an article that they had made a new route to Trolltunga that included climbing a via ferrata (Italian for iron road), I booked a tour for us in August 2012 on OpplevOdda (now know as Trolltunga Active)- I will mention OpplevOdda several times in this trip report as they have some great trips. As we live close to the area we just packed up the car and drove north on route E39 - I have plotted some of the main attractions on this Google map of west Norway. To start with the landscape is not really that exciting even when heading east on E134 towards Oslo. But then when you get to Åkrafjorden we came across Langfoss which has a total drop of 600 meters (close to 2000 feet) and it gives you an indication of things to come. Langfoss was voted to be one of the top 10 beautiful waterfalls in the world by CNN. Here you also start meeting a feature that you will come across a lot in west Norway: short and long tunnels. The landscape here is rugged and in the old days the roads were exposed to rock slides, lots of snow in the winter etc. With long tunnels you avoid a lot of these problems and some of them are impressive in length – at the moment the longest road tunnel in Norway is Lærdalstunnelsen which is about 24 km long (15 miles).The tunnels also mean that you can get from one valley to another and basically get move from one micro climate to another. We noticed this when we drove to the skiing resort of Røldal not far from Langfoss in the winter a couple of years back of 2012. At sea level by Åkrafjord there was no snow but after a couple of tunnels we came to Røldal with 3 meters of snow! 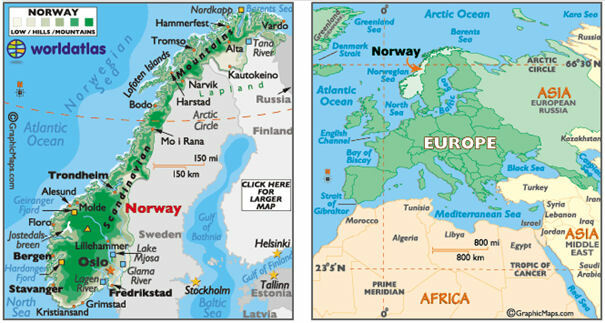 Map of Norway. Map provided by www.worldatlas.com. But back to the road trip in the summer time: about 170 km out of Stavanger you get off route E134 and turn north on route 13 towards Odda. After only a couple of minutes we saw signs that we were on Hardanger National tourist route and we also came across the twin waterfall Låtefoss. I’m a bit ashamed that I had no idea about this waterfall when we drove there the first time so we were impressed to all of a sudden come across it. But it is a great place to take a rest, stretch your legs, take some photos and feel the mist from the twin waterfall spray on your face. From Låtefoss it was only 15 km (about 10 miles) to Odda but on the way we had to slow down several times as waterfalls kept on appearing to the left and to the right and all of a sudden we also got a glimpse of the shimmering white snow and ice of the Folgefonna glacier on the left hand side – what a scenic route! I don’t know what it is about waterfalls but I’m fascinated by the roar of the water and the power of the moving masses. Today Odda is a small little town but it used to be quite the tourist destination back in the days! In the beginning of the 20th century it was one of the most popular destinations in northern Europe and in 1904 there were 80 cruise ships that came into Odda and the Hardanger fjord! They came to see the spectacular fjord, the mountains, the wild waterfalls and the glacier. We drove past Odda and along Sørfjorden (the part of Hardanger fjord that leads into Odda) and to the small place called Lofthus where we stopped to check in at Hotel Ullensvang. Again we were amazed by the beauty of the waterfalls along the way but also the steep landscape where cherries and apples trees are lines up just as you see grape vines lined up in Tuscany. This area is known for the fruit production and along the way there are small unmanned huts booths where you can help yourself to cherries and leave the correct payment. To start with we were impressed by this level of trust but when we stopped at to photograph one of these huts it turned out that there was a surveillance camera installed. Note: The currency in Norway is Norwegian Kroner and in August 2012 100 Kroner is about 17 USD or about 13 €. Hotel Ullensvang is a fascinating hotel today. It is run by 5th generation of the Utne family and it opened in 1846. Over the years it has expanded a number of times and today it is a modern hotel with various facilities such as tennis courts, swimming pool etc. But the main attraction is maybe the serenity that you get from just looking out on the fjord and the mountains surrounding it. This is the hotel that Edvard Grieg came to in 1877 and the small cabin that he used when he was composing his works can still be seen at the hotel today. The hotel contains a lot of artifacts and memorabilia from the area on display around the hotel including mannequins in bunad (the Norwegian traditional costume). Here is my review of hotel Ullensvang when we stayed there last year. On a Saturday in August 2012 we were ready for the Trolltunga challenge. We drove for about 20 minutes from Hotel Ullensvang to Tyssedal but it turned out that the trip had to be cancelled due to bad weather. But Jostein at OpplevOdda (Trolltunga Active)suggested that we could switch activities to the tour called “Tysso Via Ferrata – in the footsteps of the rallar” and we agreed to this. As I mentioned Odda was a popular tourist destination back in the days – but I guess this also meant that people within Norway and abroad became aware of the waterfalls and the potential for hydroelectric power. The work on the Tysso 1 power plant started in 1906 and only a few years later on they were able to supply factories in Odda with cheap electricity. From this point onwards Odda became an industry town. As demands for electricity increased, more power plants were made and unfortunately some of the stunning waterfalls were put in pipes in order to harness the power. On the Tysso Via Ferrata tour we first got a guided tour of the Tysso 1 power plant which now serves as a museum as the new replacement power plants have been made inside the mountains in order to avoid too many scars in the mountains around Odda. When it was in its prime it supplied about 10% of the electricity in Norway so it was a huge and modern facility back then. The story of Odda is not that unique – a lot of majestic waterfalls around Norway has been redirected and put in pipes in order to produce electricity. After the tour of the power plant museum we drove just a few minutes and parked with our guides and we got a harness and a helmet and instructions on how to use the equipment, information about always being hooked up to the cables with the two carabineers etc. It was only a short walk over the 4-5 massive pipes leading down to the power plant and we started by climbing up the along the pipes using a combination of iron ladders bolted to the mountain, using an old wooden staircase used in connection with the construction and by climbing on the rock phase itself. It felt pretty safe as we were always hooked on to the cables with the carabineers. It is pretty mind-boggling to think about the fact that this was constructed over a 100 years back and in this steep terrain basically everything had to be done by hand! We followed the pipes a few hundred meters up before we started moving away on iron ladders bolted into the mountain in a terrain that was probably at about 60 degree angle so it was steep and it is exciting if you are not used to heights – I hope that some of the photos and this youtube video can give you an impression of the climb. We ended up at Lilletopp after about 3 hours of climbing in the ladders and we walked down to the car using a different route. The Tysso Via Ferrata was great fun to try – I have wanted to try the Italian Via Ferrata for some years and this was a good substitute to start with. The route is not that demanding and it gives you a taste of what you can expect if you go for Trolltunga using “Himmelstigen”. We had great fun and I got to learn quite a bit about Norwegian history on the way! 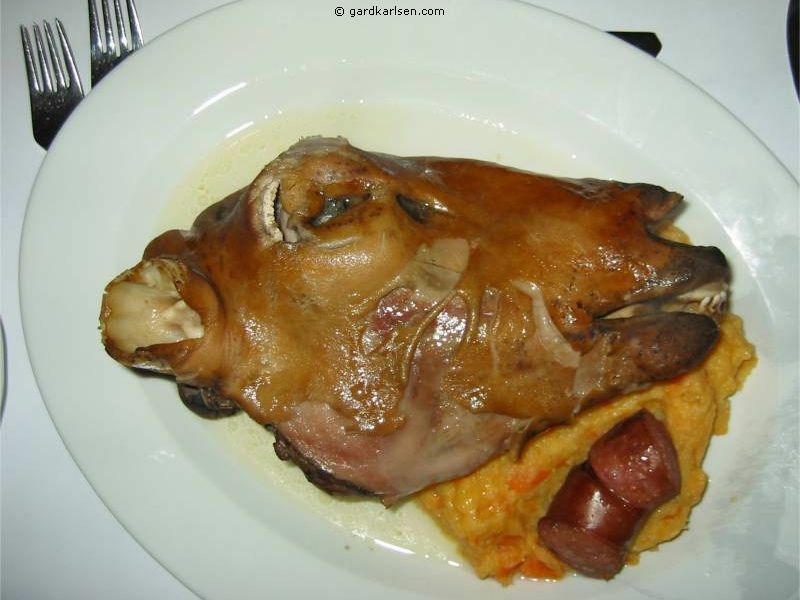 Tip: If you stay at Ullensvang hotel and go for the buffet dinner at night remember to try out local delicacies. They offer rømmegrøt (sour cream porridge), smoked whale, salmon, crab etc. And for breakfast you should not miss out on brunost (brown, sweet goat cheese). It is wonderful if you combine if on a fresh piece of bread together with e.g. honey or strawberry jam. Time for a walk on a glacier! Before this Hardanger trip I had never been on a glacier before and we decided to put this on the agenda the day after the Tysso Via Ferrata climb. The glacier Folgefonna is located right next door to Odda and it is the third largest glacier in Norway covering an area of 207 square kilometers or 80 square miles). You might think that this is remains after the last ice age but this is not the case – it was formed about 5000 years ago when climate got colder. Today melt-water from the glacier is being used for the bottled water Isklar that can be bought in most grocery stores around Norway. We check out of the hotel early on Sunday morning and we were happy to see that the weather had improved. To get to Jondal and the Folgefonna summer ski center we drove a few kilometers north to Kinsarvik and took the ferry over to Utne and drove to Jondal from there. The road is not good at all so if you plan to bring your Ferrari you might have to reconsider taking this route ;-) Not only is it a very bumpy road but we also came across cows in the middle of the road! It is also quite common to come across sheep in the middle of the road on mountain passes around Norway so remember to drive carefully! Tip: After we went there in 2012 the new Jondaltunnel has opened and combined with Folgefonnstunnel you can now drive from Odda to Jondal using these. Just note that there is currently a 100 kroner toll (about 17 USD). When we came to Jondal we drove towards the glacier and the road spiraled up continually. The summer ski center was totally deserted when we arrived and the clouds were hanging low in the terrain - I was afraid that the whole thing would be cancelled due to this. But soon we saw another car arrive and it was our guides and it took a few minutes to get dressed up in some sort of harness, helmet and we got boots, crampons and an ice axe. The top of the glacier is at about 1600 meters (5250 feet) and the parking at the summer ski center is at about 1200 meters (about 3950 feet). When we drove back it was 8 degrees Celsius at the parking (about 46 Fahrenheit) and at sea level it was 20 degrees Celsius (about 72 Fahrenheit) just to give you an idea about the temperature. We were a group of 12-14 people and we got tied together with a rope (I guess it was “Unus pro omnibus, omnes pro uno”...or one for all, all for one) and we started hiking up the first hill. To start with the ice and snow was fairly slushy as the temperature was high but it improved as we got higher and it got colder. The clouds were still very low so at times it was hard to see the difference between the snow and the clouds – I guess it would be very easy to get totally lost in weather conditions like this. After about 1 ½ hours we had a short break before we headed down in terrain towards the lake Juklavatnet – as we were walking there the sun broke through the clouds and at the same time the glacier shifted character. The route we had been taking so far was covered in snow but when we walked down this branch, the ice was exposed and it was beautiful in the sun. The ice was shimmering in a light blue color and there were cracks and caves in this terrain as the ice moves where the mountain is steeper. We could also hear the sound of ice breaking and falling off the glacier further down in this branch. Note: moving around on the glacier alone is not recommended. There can be cracks hidden by a layer of snow and when walking on the outskirts of the glacier there is always a danger of ice blocks falling. The trek on the glacier lasted about 5 hours and even if the weather was not perfect, it was amazing to experience. The beautiful light blue color of the glacier ice in the sun was unforgettable and I would love to do another trek on the glacier in the future. If you want to experience this get in touch with e.g. Folgefonna Breførerlag . We took the trek called “Blueice trip in Juklavassbreen“ but they also have other treks - you can e.g. cross the glacier and take a look at the view from the summit point - it is supposed to be spectacular. The first part of this trip report has covered our trip to Hardanger a weekend in August 2012. For the last year we have been thinking about Trolltunga and we decided to make a new attempt in August 2013. On August 1st we drove north again on the same route and I have to say that I was impressed once again by the waterfalls, the glacier, the serenity of the Hardanger fjord etc. Once again we stayed at Hotel Ullensvang and had a great dinner at the restaurant Zanoni at the hotel. You can read my review of hotel Ullensvang in this review. On August 2nd we woke up to beautiful weather and we drove to Tyssedal closer to Odda and took a left to go towards Skjeggedal (it is about 7 km from Tyssedal to Skjeggedal). I had booked a trip with OpplevOdda (Trolltunga Active) once again (it is starting to sound like I’m sponsored by them!) and this time we were going for Himmelstigen as it is called in Norwegian, to Trolltunga. You can see the location of the Trolltunga starting point on my Norway Google map. Note: the parking for one day is 100 Norwegian kroner. You can pay for parking and the tour with a credit card at the tourist info. This is also the location if you want to do the regular hike to Trolltunga. We met up with the guides and got a harness, helmet and a bike and paid the fee and started biking. According to OpplevOdda “If you're in normal good shape, and over 15 years of age, OpplevOdda would like to invite you on this trip.” The first part is biking on a mountain bike for about 7 km (about 4.5 miles). We biked along the lake Ringedalsvann and the water in this lake is so clear that it is almost spooky – apparently you can go kayaking on the lake and it is spectacular in great weather as the visibility is so good. The road soon went from a wide road to a dirt road and it got more and more narrow. On the right hand side it was a bit of a drop down towards the lake so it is best if you are relatively comfortable on a bike and have good balance. At some places there had been rock slides and we had to walk over these sections. After about 7 km we parked the bike and started the second leg of this tour. The hiking was in fairly steep terrain (rock face covered with loose dirt, pebbles and brush) and it was a bit slippery. As the weather was good I was walking in a pair of shorts and with running shoes which worked out fine. After about 1 km in this terrain we came to the lunch stop – we just camped by a small stream and it was a good opportunity to fill the water bottles straight from the stream. The landscape was impressive as we were heading up an old river bed. Not any river bed – this was where the river flowed when Tyssestrengene waterfall was free to crash down from the mountains above. Tyssestrengene was one of the highest waterfalls in the world with vertical drop of 312 meters (1000 feet) but in connection with the power plants in the area, the water fall has been redirected in pipes. After lunch we continued for another km or two in terrain with boulders and rocks until we reached the starting point for the climbing. As we experienced last year, we strapped on a harness and helmet and locked into the cables with two carabiners. To start with it was not that difficult but soon we were climbing more or less vertically and you climb about 200 meters! With the experience from last year, the climb was manageable but you should probably reconsider this route if you have a fear of heights! When we reached the top we were at about 1200 meters and had an amazing view of the lake Ringedalsvann, parts of the Folgefonna glacier and surrounding mountains. We stopped by to look at the huge potholes made by the river that used to flow here before crashing down 300 meters and it was only 1 km to walk over to the Trolltunga. The weather was perfect and the view to Trolltunga was breathtaking when we got there. The rock known as Trolltunga is located at about 1200 meters and it hangs about 700 meters above the lake below. As you can see from the photos the view is incredible. Over the years this place has become more and more popular and on weekends with great weather you might experience quite a lot of people at the top. We had to line up for a few minutes to take some photos of us on the rock but it was quite a rush sitting on the edge of it! Note: you don’t have to climb to get to Trolltunga. Follow the instructions on http://ut.no/tur/til-trolltunga but keep in mind that it is a 21 km hike (round trip) (13 miles) with a climb of about 750 meters (about 2500 feet). That is quite a lot if you are not used to a bit of hiking! We didn’t stay at Trolltunga that long – we still had to get back to the starting point. I have to admit that climbing down was the scary part! Going up I kept focus on the next step and basically just looked up – going down it was necessary to look down to see where the next step was located and this means that you get a true impression of how high up you really are! It didn’t help that one doesn’t always have a clear view of where the next step down is. I was quite happy to get back down so I could start the hiking instead. We started our trip at about 10:30 am and we came back to the parking lot at about 8 pm. This hike was hard and we were both quite sore in legs and arms several days after the climb. Before you go on this kind of adventure make sure that you are in good shape and that you can handle biking in various terrain, hiking in steep terrain and that you are not afraid of heights. It was a breathtaking adventure and with perfect weather we got to experience Trolltunga that way you see it on postcards! When we got back to the hotel that night it was pouring down so we were very lucky when it comes to the weather! It was so rewarding to take a warm shower when we got back to the hotel! Note: bring enough water and food! We brought along a 3 liter CamelBak that we shared and I had to refill it on the way down. Bring good clothes as weather can change fast in the mountain – bring a spare inner layer so that you can change if you pick up a sweat and bring layers (e.g. a thin fleece and a GoreTex jacket). I always bring gloves and a hat as well. What kind of shoes to use depends on the weather. As we had already seen a bit of Hardanger last year we decided to move a bit north this time to check out parts of Sogn. The day after the hike to Trolltunga we checked out of the hotel and with our sore legs we limped to the car to drive north. We drove to Brimnes and took the ferry to Bruravik and headed north on route 13 / 7. Note: the Brimnes-Brurarvik ferry will soon be replaced by the Hardangerbrua (see Hardangerbrua.no ) which will be a bit longer than the Golden Gate Bridge in San Francisco. It will be the longest suspension bridge in Norway and among the top 10 in the world. The bridge toll is said to be 150 Norwegian kroner! Our destination was Vossevangen or just Voss as it is also known as. This place is known for extreme sports, rafting, hiking, skiing and smalahove. The latter is a...eh...dish that includes half a head of sheep. It is quite tasty but looks pretty barbaric as you don’t often get to stare into the eye of the animal that you are about to eat ;-) See VisitVoss. We parked at Voss train station and we got there just in time to catch the train to Myrdal. This is a part of the Bergensbanen (from Oslo to Bergen) but we only took the train about 45 minutes to Myrdal station (you can check information on nsb.no) as our goal was to take the Flåm railway. Flåm railway is impressive as construction started in 1924 and most of the 20 tunnels along the 20 km railway were built by hand (by drilling and blasting but without access to modern day machines). The railway stretches from 865 meters to 2 meters in Flåm making it one of the steepest railways in the world. In the past it was an important link between the railway from Bergen to Oslo and the ships that sailed into Flåm in Sognefjorden. But these days the train is just a tourist attraction as you get to see the dramatic scenery of Norway in a short period of time. When we got to Myrdal we basically just crossed the platform and boarded the Flåm railway train and you buy the ticket on board. A round trip ticket on the Flåm railway is 380 Norwegian Kroner (about 65 USD) per person and the ride takes about 1 hour each way. Tip: The view is best on the left hand side when going from Myrdal to Flåm. Try to get a seat where you can open the window. The train ride gives spectacular views of Norwegian landscape at its best: the fjords, valleys, country homes, waterfalls, etc. and There is also running commentary in lots of languages along the way on as info is shown on flat screen TV’s. After about 4 km we had a 5 minute stop at Kjosfossen. According to Norwegian folklore there were seductive forest creatures (siren) called huldra and in the summer the huldra appears dancing along the waterfall. It is kinda tacky I guess but we aim to please the tourists in Norway ;-) We spent most of the time looking out the windows. Flåm does not have that much to offer apart from the scenery. Today it seems to work as a transport hub as cruise ships can come in, tourists are moved in and out of buses and tourist come of and get on Flåm railway. The small community can offer some restaurants, hotels and a large souvenir shop. We just spent a couple of hours there having a picnic to celebrate an anniversary before we headed back to Myrdal and back to Voss. You can read more about the Flåm railway on VisitFlåm. A great wine cellar – in Voss? We were spending the night in Voss and in advance I had searched to see if there were any restaurants and I came across Restaurant Elysée at Park hotel. I got a bit fascinated when I started reading about it as this restaurant can offer between 40.000 and 50.000 bottles of wine! If you go there without reservation you only get to see the short wine list but if you get in touch with them in advance you can get the full list and you can get them to bring out the wine that you want. I was also pleasantly surprised by the prices as it was not tripled or quadrupled as it normally is in Norway. The wine list had lots of vintage wine and vintage champagne at pretty good rates. The restaurant itself is not really a fine dining place – serving a buffet to tourists that are passing through seems to bring in the money. But we decided to have a dinner based on the short a la carte menu. When we arrived we were served a pre-ordered champagne and we got a short tour of one of the wine cellars and I guess it is what you can call organized chaos :-) Boxes were stacked on top of each other, yellow post it notes were hanging around and bottles were laying and standing everywhere. But there were some really nice bottles of wines here and I even saw some bottles of Madeira wine dating back to 1905! Our meal began with a pretty bland bruschetta amuse bouche – seemed like a store bought baguette with chevre topping. My fish soup to start with was not bad and seemed to contain both salmon and cod like fish together with some roe on top. My meat was maybe a bit more than medium done and not that tender but it went very well with the wine that I had ordered. I ended with a panna cotta served with a raspberry ice that was very good – but I kept on dreaming about the Sauternes that I saw in the wine cellar earlier in the evening ;-) Our waiter seemed a bit nervous but did an OK job during the evening. We stayed at Fleischer’s hotel in Voss for one night and it was quite an experience. I don’t mind paying a lot if I get a very nice hotel room but at Fleischer’s hotel I felt like we ended up a ridiculous amount for what is best described as a motel room! You can read my review of Fleischers hotel here. We drove north on route 13 and E16 after we checked out of the hotel and we took a left turn when we saw the sign to Stålheimskleiva. I assume that this is the old road that you had to use before the various tunnels were made. Today you get a great view of Nærøydalen as you drive down the hairpins of Stålheimskleiva and on the way you get a view to water falls on both sides (Sivlefossen and Stålheimsfossen). Luckily the road is a one way street today and hence we had the opportunity to stop and take photos on the way. Note: Stålheimskleiva is a one way street these days and you can only drive it down from Stålheim hotel. You can actually check it out on Google Streetview if you want to get an impression of the road! We drove the short distance to Gudvangen and there we got a view of Nærøyfjorden (the Nærøy fjord) which was named as a World Heritage site together with Geirangerfjord in 2005. There are many fjords to choose from in Norway but I guess Nærøyfjorden was chosen as it is long and narrow and that makes it spectacular. We were planning on driving onwards to Flåm but a ferry came in and as the weather was good we decided to drive the car onboard and take the cruise to Flåm instead. The fjord is just 250 meter (800 feet) wide at some places while the mountains surrounding it are as high as 1760 meter (about 5800 feet). Mix in some amazing waterfalls, patches of snow and houses in places where you think it would be impossible to build...well, then you have a picture perfect Norwegian fjord. The cruise took about 2 hours and cost about 950 Norwegian kroner (160 USD) for the car and the two of us. Note: if the weather is good and you are there in the main tourist season of summer, make sure to get on board early to grab a chair so that you can sit outside and enjoy the view. From Flåm we started our 350 km (220 miles) drive back to Stavanger. On the way home we had lots of rain and it seemed to make the waterfalls along the way even more spectacular. I hope that this trip report has given you some idea of what you can expect from a visit to the western part of Norway. As you probably understand from my descriptions, I love the fjord landscape of western Norway. I love the waterfalls, the mountains, the patches of snow on the mountain tops, the calm water in the fjords, the view of the glaciers etc. If you want to be active there are lots of hiking, climbing and kayaking that can be done in this region of Norway and you can be active both in summer and winter. I think it is best to come to the region in June/July as there will still be snow on the highest peaks while the trees and flowers are in blossom by the sea level. Feel free to continue to the next page of this trip report: more photos from the trip.